This sedate and handsome Italian Renaissance-palazzo-style building was erected in 1925 and converted to a cooperative in 1980. It has 79 apartments. 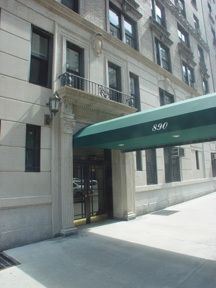 The beige-brick, 16-story building has a two-story rusticated limestone base with bronze entrance doors that lead to a nice, marble lobby. The canopied entrance is flanked by lanterns. 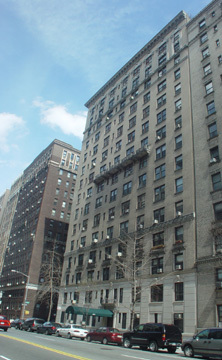 The building, which has a large cornice, has an elevator person, protruding air-conditioners and no sidewalk landscaping, no garage and no roofdeck. The building's facade has some decorative balconies, attractive pilasters near the top, four bandcourses and some attractive spandrels and a good cornice.